The best in Standup comedy right on your doorstep. 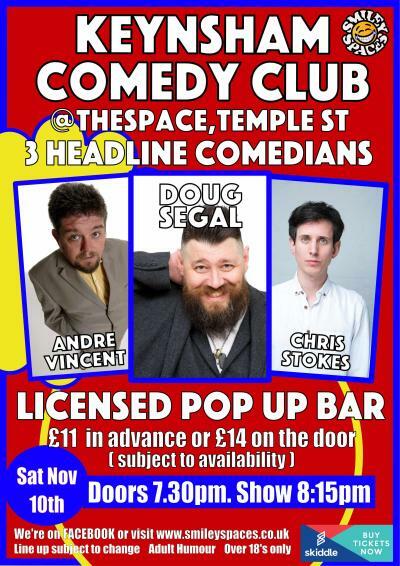 This month at the Space in Keynsham we present the astounding Doug Segal“Imagine if Derren Brown was funny” – London Evening Standard. Described by Time Out as “the UK’s best kept entertainment secret”, The wonderful Chris Stokes ‘He has the talent to one day have the world at his feet’ The List, and the one and only Mr. Andre Vincent ‘An improvising comedy genius’ – THE GUARDIAN. Come along and watch probably one of the best bills in the uk on that evening.